integrated into Oracle Applications Release 11? The Oracle Applications Developer's Guide Release 11 and the Oracle Applications User Interface Standards Release 11. The AU_TOP/forms/US/TEMPLATE.fmb for developing a new form. The AU_TOP/forms/US/APPSTAND.fmb contains standard property classes for your runtime platform. The AU_TOP/resource/FNDSQF.pll contains routines for Flexfields,Function Security, User Profiles, Message Dictionary. The AU_TOP/resource/APPCORE.pll contains standard User Interface routines. The AU_TOP/resource/APPDAYPK.pll contains the Calendar Widget routines. The AU_TOP/resource/CUSTOM.pll for adding custom code which affects Oracle Applications forms without changing Oracle Applications code. The AU_TOP/resource/GLOBE.pll allows Oracle Applications developers to incorporate global or regional features into Oracle Applications forms without modifying the base Oracle Applications forms. Globe calls routines JA, JE, and JL libraries. The AU_TOP/resource/JA.pll called from Globe and contains Asia/Pacific code. The AU_TOP/resource/JE.pll called from Globe and contains EMEA (Europe/Middle East/Africa) code. The AU_TOP/resource/JL.pll called from Globe and contains Latin America code. The AU_TOP/resource/VERT.pll allows Oracle Applications developers to incorporate vertical industry features (for automotive, consumer packaged goods, energy, and other industries) into Oracle Applications forms without modifying the base Oracle Applications forms. Oracle Developer/2000 Server Release 1.6.1. NOTE: All FMB and PLL files must be migrated to your desktop if you intend to develop and integrate custom applications into Oracle Applications Release 11. 92. What are the supported versions of Forms and Reports used for developing on Oracle Applications Release 11? 93. How do I compile and/or generate an Oracle Applications form? Make copies of all required files. Replicate the AU_TOP directory structure on your desktop. Move the files to their appropriate AU_TOP/forms/US for FMB and AU_TOP/resource for PLL. Include the AU_TOP/forms/US and AU_TOP/resource directories in your FORMS45_PATH. Open, compile and/or generate forms. NOTE: The FORMS45_PATH is specified either in your Registry or oracle.in. It may sometimes be necessary to convert FMB -> FMT and PLL -> PLD before porting from a Unix platform to your desktop. 95. How do I add a CUSTOM_TOP to Oracle Applications? as the other product directories. f. Shutdown and restart your Internal Concurrent Manager (ICM) so that the concurrent manager will recognize the change to the environment that was made to the APPLSYS.env and Registry. 96. How to get the data from the views in Multi_ORG views ? Using the profiles and client info package. If we can‟t get the data with the above query then we have to write a procedure as shown below. END;Compile and run the query once again. 97) What is Responsibility / Request Group? The Descriptive Flexi field is a field that we can customize to enter additional information for which Oracle Apps product has not provided a field. Ex. ATP program calculates for those warehouses where Inventory Org Type is DC or Warehouse in DFF Attribute11 of MTL_PARAMETERS table. 99) What is Value Set? Value Sets define and store the valid items of data, which may be entered into a field. Key Flexfields, Descriptive Flexfields and many standard fields use Value Sets. Oracle already comes with hundreds of Value Sets. We define additional Value Sets to support our own user-defined Key and Descriptive Flexfields (although we may use any existing standard Value Sets if they suit our purpose). In defining a new Value Set, we are defining the physical format of valid data, which can reside in that Value Set. 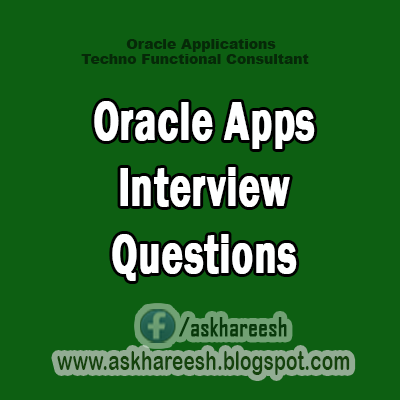 Ans: It is data security functionality in Oracle 10.6 and above. Applicable User responsibilities are created and attached to specific Operating Unit. User can access the data that belongs to the Operating unit they login under. The benefit is it enables multiple operating units to use a single installation of various modules, while keeping transaction data separate and secure by operating unit. 101) Can you explain the Organization structure? Business Unit / Group : It represents the highest level in Organization structure and has no accounting impact. It determines which employees will be available to Set Of Books and Operating Units. Ex: Consolidated Enterprise / a major division / an operating company. It is the highest level with accounting significance. Document Sequencing (important in Europe) is at the Set of Books level. Also Period open/close is at the Set of Books level. A Set of Books is associated with only one Business Group. A Business Group may be assigned several Sets of Books i.e Multiple sets of books can share the same business group if they share the same business group attributes. Legal Entity: A legal company for which you prepare fiscal or tax reports. Each Legal Entity is associated with only one Set of Books. A Set of Books may have multiple Legal Entities. Operating Unit: An organization that uses oracle order management, cash management, shipping execution, payables, purchasing and receivables. It may be a sales office, a division, or a department. Standard reports are at the Operating Unit level. An operating unit is associated with a legal entity. Inventory Organization : An organization for which you track inventory transactions and balances, and/or an organization that manufactures or distributes products. An Operating Unit may have multiple Inventory Organizations. Subinventory: An inventory organization has a number of subinventories associated with it. Locator : These are the different locations in side a subinventory. 105)What are the mandatory parameters in Concurrent program?